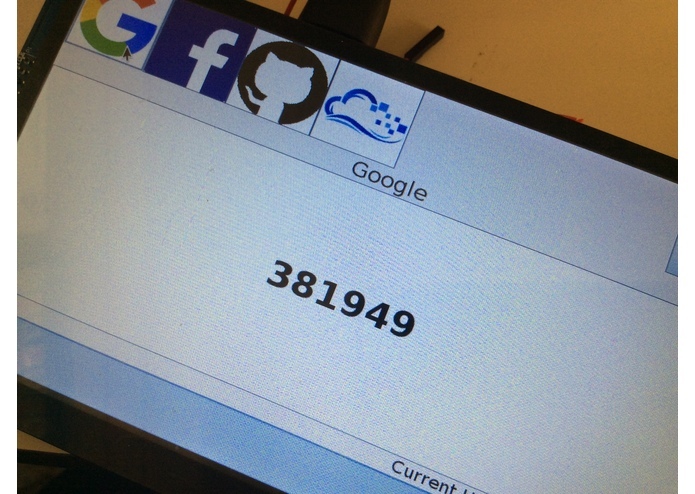 The two-factor authentication code on the screen, tap it and it would type it in for you. On the trip to HackWestern, we were looking for ideas for the hackathon. We were looking for things in life that can be improved and also existing products which are not so convenient to use. Jim was using Benjamin's phone and got the inspiration to make a dedicated two factor authentication device, since it takes a long time for someone to unlock their phone, go through the long list of applications, find the right app that gives them the two-factor auth code, which they have to type into the login page in a short period of time, as it expires in less than 30 seconds. The initial idea was rather primitive, but it got hugely improved and a lot more detailed than the initial one through the discussion. It is a dedicated device with a touch screen, that provides users with their two-factor authentication keys. It uses RFID to authenticate the user, which is very simple and fast - it takes less than 2 seconds for a user to log in, and can automatically type the authentication code into your computer when you click it. The system is majorly Raspberry Pi-based. 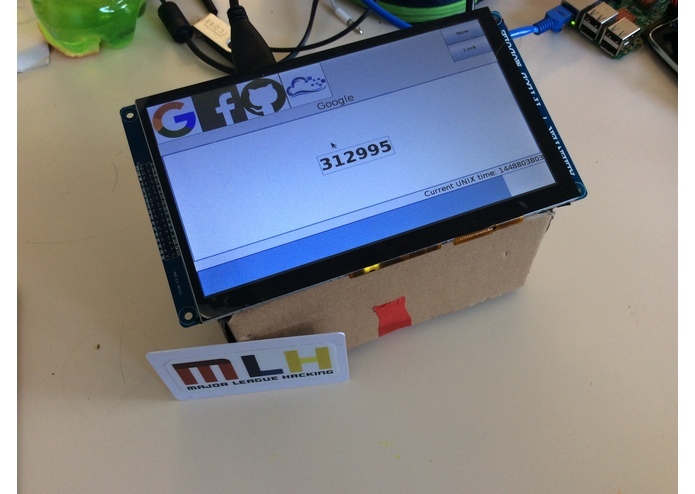 The R-Pi drives a 7 inch touch screen, which acts as the primary interface with the user. The software for the user interface and generation of authentication keys are written in Java, using the Swing GUI framework. The clients run Linux, which is easy to debug and customize. Some lower level components such as the RFID reader is handled by an arduino, and the information is passed to the R-Pi through serial communication. Since we lost our Wifi dongle, we used 2 RF modules to communicate between the R-Pi and the computer. It is not an ideal solution as there could be interference and is not easily expandable. We have ran into some huge problems and challenges throughout the development of the project. There are hardware challenges, as well as software ones. For example, the 7 inch display that we are using does not have an official driver for touch, so we had to go through the data sheets, and write a C program where it gets the location of the touch, and turns that into movement of the mouse pointers. Another challenge is the development of the user interface. We had to integrate all the components of the product into one single program, including the detection of RFID (especially hard since we had to use JNI for lower level access), the generation of codes, and the communication with other devices. We are proud of ourselves for being able to write programs that can interface with the hardware. Many of the hardware pieces have very complex documentation, but we managed to read them, and understand them, and write programs that can interface with them reliably. As well, the software has many different parts, with some in C and some in Java. We were able to make everything synergize well, and work as a whole. To make this project, we needed to use a multitude of skills, ranging from HOTP and TOTP, to using JNI to gain control over lower levels of the system. But most importantly, we learnt the practical skills of software and hardware development, and have gained valuable experience on the development of projects.